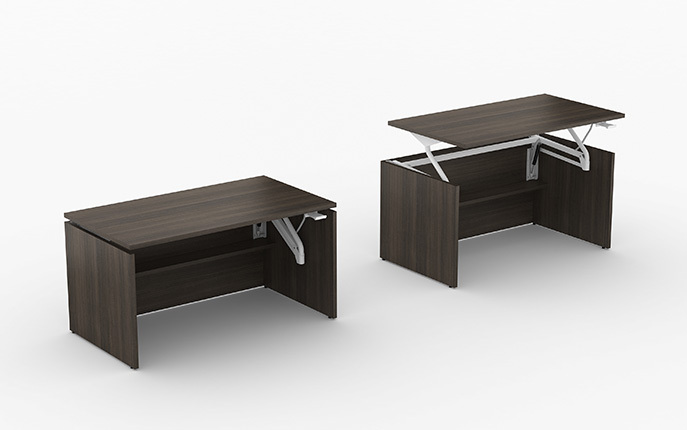 Swift Lift tables are a height-adjustable sit-stand solution that meets the demands of healthier work environments. Various individuals spend a large portion of their day sitting at their workstation. Swift Lift helps enhance wellness and well being by allowing individuals to intermittently and effortlessly change their posture from sitting to standing in order to relieve fatigue and discomfort. Swift Lift is an environmentally friendly solution containing over 80% recycled wood fiber content and up to 15% post industrial steel scrap. Swift Lift is Greenguard Indoor Air Quality® certified and is 100% recyclable. As recommended by ANSI/BIFMA and various ergonomist, adjusting one’s posture throughout the day from sitting to standing creates movement that is associated with the flexing of the spine, which improves circulation and lubricates joints. This helps to reduce long term muscle fatigue and leads to the reduction of back pain. Swift Lift is a great solution for hoteling multiple users of different height and their individually preferred postures.